My number one beauty tip/advice that i give to anyone especially during the summer is never leave your house without sunscreen!Ofcourse,if you live in sunny countries it's good to use one during winter too but let's stick to the summer!Sun can really destroy your skin,dehydrate it,cause photoageing and discolorations! Today i will share with you my favorite one,which i use it for almost 2 years now!It's the Sunscreen Velvet Face by Frezyderm!I didn't find anything better all this time,so i guess this tells a lot about the product!If you keep up with my little blog for quite a long time now,maybe you remember that i wrote again a review about it! But as you can guess the photos is too bad and i don't really like the review,so instead of changing completely that old post i decided to just write another one,hopefully better and more helpful! First of all,the one that i pick up is with 50+ SPF,which means that you have very high protection from the sun!You can also find from the same line,sunscreen with 30 SPF and also some with color on them! It's dermatologically tested,parabens free and water resistant!It claims that afford effective cellular prophylaxis,which as you can tell it's something that i can't really notice but if they say so! I notice that other sunscreens may make our face looks oily and sticky,smells a little but weird and leave white marks on the skin! With that product things works exactly the opposite!Because of the Second Skin Technology,it leaves a velvety feeling on the skin!It's clear,so you don't need to worry for white marks and at the same time the skin stays matte for hours! I love wearing makeup,even with that hot weather but at the same time i know how important is to wear sunscreen before that!And this is a challenge because most of those kind of products that i tried before make the skin oily,sticky and really hard to apply and blend the foundation properly! But the one that we talk about today,it seems to work like primer!It helps the makeup last for a lot of hours,smooth out the skin because of the gel consistency and it's water resistant,so it helps a little with sweat and all this things during the summer! Last but not least,i want to write two or three lines about the packaging,because i always do and for me personally can add a little bit of something something on the product! Also i really like that the pump give you exactly the amount that you need! (The photo above is just one pump) My face is quite wide though so i use about one and a half pump!Speaking of pump,you can twist and lock it,pretty cool if you ask me,in case you want to throw it in your bag! Overall i highly recommend that product or at least check it out in a store and i'm sure,just by this you will love it too! 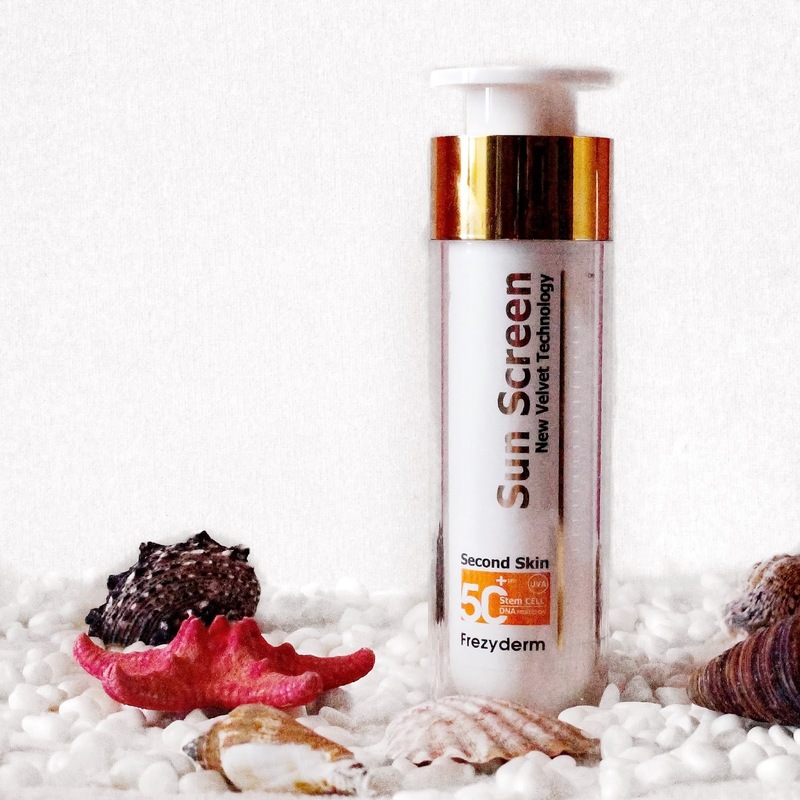 Do you ever tried this product?What's your favorite sunscreen?